We were joined by the Mayor of Frenchtown NJ, Warren Cooper, who toured the entire display and talked to the owner-drivers. 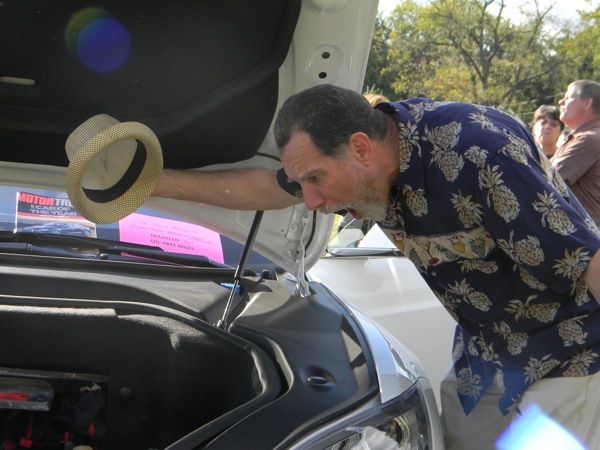 More than a hundred other attendees of the Frenchtown Green Fair visited, and next year the organizers want to feature the plug-in vehicle display more prominently so we get more foot traffic (700-1000 folks were at the Fair! The drivers had a wonderful time talking to each other and to the interested public. Very grateful for the tremendous success of our inaugural National Plugin Day event and look forward to repeating next year! We anticipate over 100 green vendors and over 1000 visitors at this year's Fair. With various speakers, activity tents and much to learn and see, it will be a true celebration of sustainability! Our keynote speaker is Mike McGrath, host of the nationally syndicated public radio show You Bet Your Garden, on "Everything You Know About Composting is Wrong.". Featured speakers: Christine Waltermyer, Founder and Co-Owner of the Natural Kitchen Cooking School, presenting "Decadent Rice-based Desserts." Maya van Rossum, of the Delaware Riverkeeper, on fracking and how it affects the Delaware River Watershed. Eyes of the Wild, live animal show, hosted by the fantastic and zany Travis Gale. Rutgers Landscape & Nursery presents a Touch-a-Bug Children's Workshop. Rob Fleming, Director of Sustainable Design Program at Philadelphia University,will discuss Beyond Green; How Can Sustainable Design Transform Our Lives. The Alternative Fuels Area will present conversion & production EV's, plug-in hybrids, and other alt-fuel vehicles, providing an opportunity for interested visitors to speak with owners, drivers, and dealers. We look forward to a great turn-out of cars for the 2013 Frenchtown Green Fair. Exhibiting is free for private owners; dealerships will be charged our standard low vendors' fee.